2013 repress; 1993 reissue of this 1976 album. "One of the most groundbreaking bands of their time. From early avant-garde jazz work on the Strata East label to their later fusions of Afrobeat, funk and spiritual jazz, Oneness stand as a huge influence for today's jazz scene. 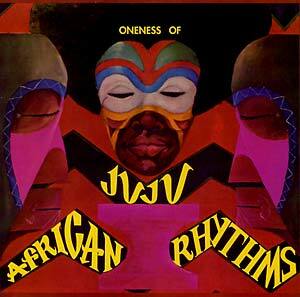 Released in 1976, the African Rhythms album is Oneness Of Juju's masterpiece. Bandleader J. Plunky Branch had moved back to his hometown of Richmond, Virginia from New York and introduced R&B, funk and African percussion into his music to appeal to the local market. Topped by the soaring vocals of Jackie Holoman-Lewis, the Oneness sound became a tight, supremely soulful outfit. Although it sold to the local market, African Rhythms was revived in the late '80s when rare groove fever hit the UK. Ever since, the album has been an essential part of any soul and funk DJ's collection."